Shoulder Pain After a Big Hit or Car Accident? Could it Be a Dislocation? Shoulder dislocations are synonymous with sports such as football and hockey but if you attempt to brace yourself with an extended arm after a fall in baseball, volleyball or gymnastics, you could be just as susceptible to a shoulder dislocation. No one wants to sideline themselves because of some shoulder discomfort or go through a time consuming shoulder surgery and the ensuing recovery process. However, an untreated shoulder injury could lead to damage to the muscles, ligaments and tendons in the shoulder as well as leave us more susceptible to further injuries or mobility complications. We carry a lot on our shoulders. From shampooing our hair to carrying a laundry basket from one side of the house to the other, we use our shoulders for nearly every one of our daily tasks. It carries the greatest range of motion of any joint in our bodies and thus requires a great level of flexibility in order to maintain proper function. If you are suffering from any of these symptoms, you should consult with your local orthopedic surgeon immediately to limit the severity of your symptoms and receive the quickest recovery. Your orthopedic surgeon will perform a physical examination of the shoulder to identify the root cause of your pain and discomfort. 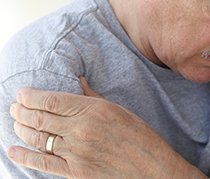 Examining which points are tender or bruised and evaluating the flexibility of your shoulder joint should give the physician a good idea of the severity of your condition. If there is not an obvious sign of a dislocation, the sports medicine specialist may perform an x-ray, MRI or ultrasound to get a deeper look into the joint to confidently diagnose your shoulder dislocation. There are treatments for dislocated shoulder joint pain. Patients suffering from a dislocated shoulder require both conservative and proactive recovery steps to receive the best possible treatment for dislocated shoulder. There are non-surgical treatment options for shoulder injuries, which might include time off from a specific injury-causing activity. If a shoulder problem is being caused by a sport or a certain type of work, some modification in your exercise regimen or duties will be recommended. We may also prescribe nonsteroidal anti-inflammatory meds such as aspirin and ibuprofen to reduce swelling. Physical therapy can help recover mobility and keep the supporting muscles strong. Some types of shoulder dislocation may require surgery. An operation may be performed arthroscopically with tiny instruments and a camera. Other cases may require open surgery, which involves a larger incision so the surgeon can see and access the joint and surrounding structures. In any case, post-surgical rehabilitation is critical to the success of the treatment. While the process may seem agonizingly slow to a high-performing athlete, it’s necessary to give the joint time to heal. The shoulder may be immobilized temporarily with a sling. Exercises can gradually improve strength and range of motion. If you are suffering from shoulder dislocation or would like to speak with a specialist, reach out to us today!